6 Unit masonry bldg. 4 one bedroom units & 2 efficiency units. Also 2 car garage. 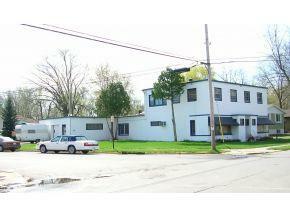 Bldg has basement with coin laundry machines & crawl space under the 2 efficiency apts. Bldg sits in a pleasant residential area. Call for income & expenses. Gross Income presently about $35,700 (Oct 2018). Bldg built about 1946.